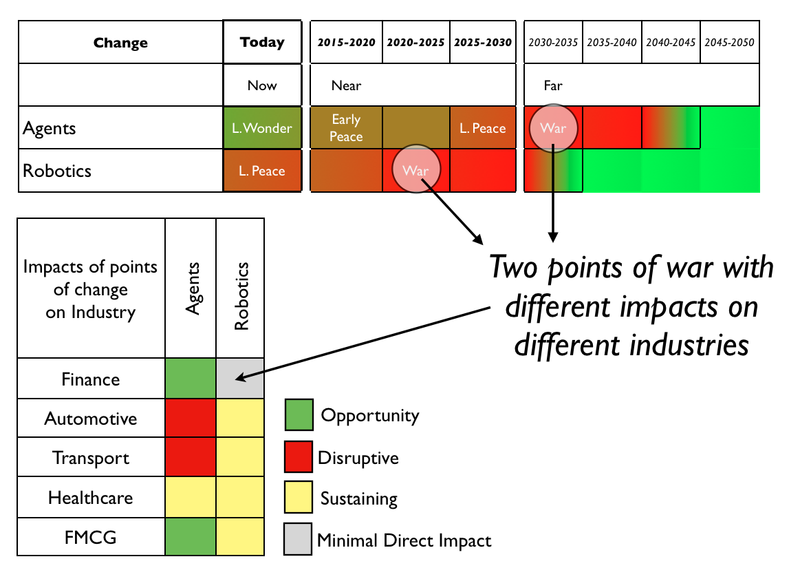 When examining potential points of future change, I use a very purposeful distinction between robotics and intelligent software agents. One is a component of the other. Robotics is rapidly heading towards a state of early generic robotic platforms (as per Baxter) which over time promise greater commoditisation of this space (often associated with human physical effort). As we all hopefully know by now, it’s never the first innovation of something that overhauls our society but commoditisation of pre-existing acts. Robots have existed for sometime, generic and hence more commodity robotic platforms haven’t. However, those generic robotic platforms are limited in scope to the system in question because the “intelligence” behind them is targeted to that scope. When you examine medical systems or self driving cars or SIRI or any number of environments – the intelligent agents are specific. There is no generic intelligence agent … yet. But there will be (see figure 1). 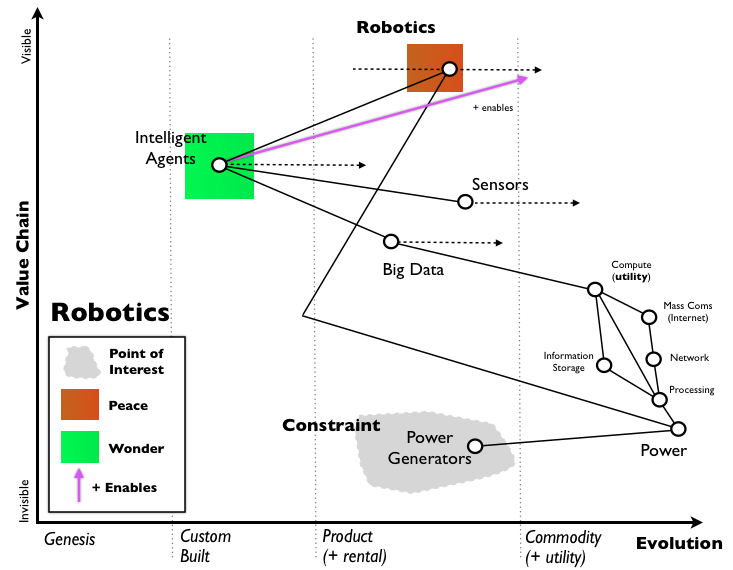 Figure 1 – map of robotics. Today’s “intelligent” agents are still in relatively early stages. But in the near future the “intelligent” agent needed to drive your car will be no different to the one that flies a plane, delivers your coffee or undertakes your cosmetic surgery. Obviously those “intelligent” agents will be trained for the task in hand and some will be trained for multiple tasks. But this “intelligent” capacity will be very much a commodity. So what’s with the distinction here? Why bother? Well, as things evolve they go through the stages of wonder, peace and war. 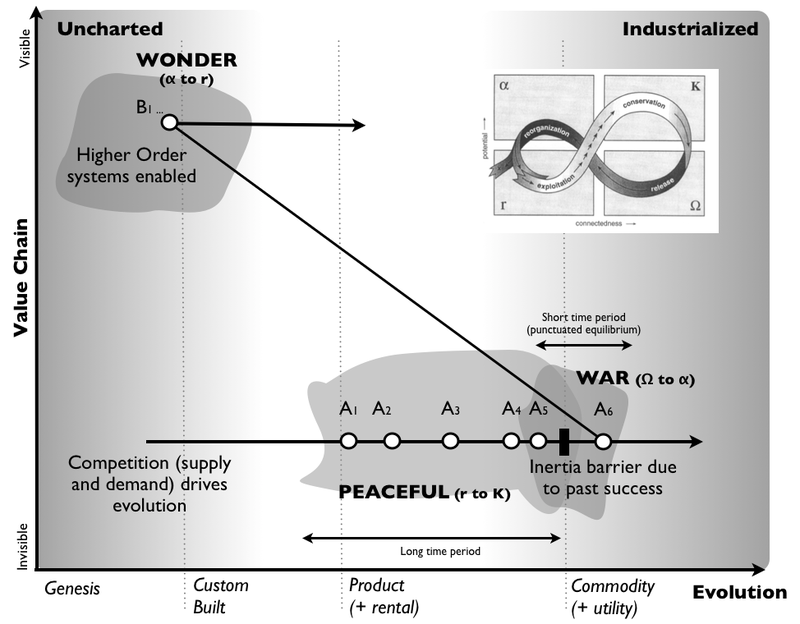 It’s never the wonder but the war stage (where things become commodity) that impacts society widely depending upon how well spread the activity, data or practice is in other value chains. Hence in this case, then in the first instance we will see disruption and change caused by the introduction of generic robotic platforms but because these will have targeted intelligent agents they will be generic to a specific area – the intelligence behind self driving cars will not be the same as the intelligence behind your surgeon. Hence to some extent the impact will be constrained. Much of the disruption will start in robotics manufacturing and existing industry users. These targeted systems will tend to be adopted by other industries hence the self driving car will be a feature differential of high end vehicles and not a destroyer of the automotive industry. Alas, there’s a later stage when the intelligent agents become commodity. At this point we will see truly commodity platforms in robotics and numerous other fields. This in turn will drive commoditisation in those sectors. Every car, every airplane, ever railway, every truck, every ‘doctor’ will be a ‘self driving’ and intelligent machine based upon the same intelligent system. The once benign feature differential of high end cars becomes the commoditising force behind the entire industry. So why mention it? Well, I’ve summarised this in figure 3. In the first wave (2020-2025) we should see rapid introduction of generic robotic platforms for different activities based upon targeted intelligent agents. Expect commercial high end self driving cars, increased use of robotic platforms such as Baxter. The impacts of this will generally be adopted by various industries from automotive to transport to healthcare. Disruption will tend to be fairly minimal or localised to existing users and robotics industry. In the second wave (2030-2035) then you should expect to see the rapid introduction of generic intelligent agents. The agent that drives your car, pilots the plane, automates your house will be the same. This will rapidly spread impacting and commoditising multiple industries. Every car will be self driving – not that you will own a car anymore, you’ll just pay for the use of the journey through an Uber like service. The entire transportation system will change. Many will be disrupted. Now whether the timings are right here is highly questionable. The overall transition to commodity depends simply upon competition but the timing depends upon individual actors actions – this is always unpredictable (see Hayek and the pretence of knowledge). There is also constraints such as power and impacts such as Jevon’s paradox to consider. I would suggest however, that before people claim doom to humankind and our role in society due to the introduction of generic robotic platforms that they consider there are two waves approaching. The later is unquestionably the more dangerous in terms of social policy but it also allows for the greatest possible number of recombinations of higher order systems and hence the creation of unimagined roles today. In much the same way the gas lamp lighter could see their job going but no-one could tell them that we’d have radio producers, television personalities and computer programmers – then the Barista maybe worried by a robot but find themselves later on as a counsellor to a neurotic intelligent agent. Can you honestly say that intelligent machines aren’t going to need psychologists? Have we forgotten that the best chess computer in the world can beat a human BUT an average chess player with an average chess computer can beat the best chess computer? So, will everything be rosy? No. But the real threat to society is not so much the machines but other humans and self interest. I’ll leave that post to another time – fortunately by my reckoning then we still have quite a bit of it left. Simon Wardley does research for CSC’s Leading Edge Forum on behalf of the Client Members of the LEF and is on the advisory board for O’Reilly Strata (a big data conference), the Co Chair of Cloud Camp London, and a Fellow of Open Forum Europe. This article originally appeared here, republished under creative commons license.